Experience the beauty of Montreal during the holidays on this Christmas-themed walking tour. Following your professional guide through the historic streets of Old Montreal, you’ll get wrapped up in the Christmas spirit as you admire the city’s twinkling lights and elaborate decorations. 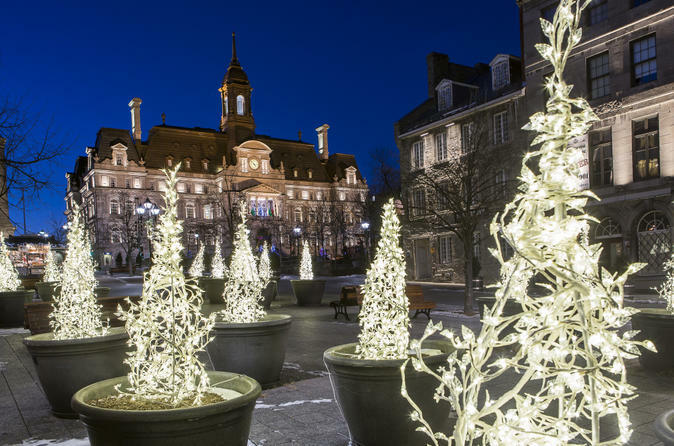 Visit Victoria Square and learn about the city’s centuries-old European holiday traditions, and see beautifully adorned Santa Claus figurines before checking out famous Bonsecours Market. Meet your guide and group at Victoria Square in the evening and begin your Christmas walking tour through Old Montreal, the oldest area of the city. Feel as though you’re traveling through time as you explore the historic streets with your professional guide, who’ll tell you about Montreal’s holiday traditions that have been a part of the city’s culture for centuries. Get into the holiday spirit as you admire the wonderful decorations and shimmering lights of Old Montreal’s streets, shops, museums and hotel lobbies. As you wander, learn about New France, the area colonized by France in the 1500s which includes Montreal, and hear how the region's customs are still alive today. Head to Montreal’s World Trade Center to check out its Santa Claus exhibit, where you'll see beautifully adorned Santa Claus figurines -- sure to delight people of all ages. End your tour at the two-story domed Bonsecours Market, which has been Montreal’s main public market for more than 100 years. Browse specialty Christmas items as well as local artwork, jewelry, clothing, furniture and kitchenware -- this is a great place to stock up on Christmas presents for the whole family!